Ever want to just say "Thank You" to a veteran? Let's give honor where honor is due. Whether you're honoring a veteran in your church, at home, in your local community or anywhere else for that matter we need to show them as best as we can how much we appreciate their sacrifice to us and our country! It is very heart warming to me to know that there are people out there that would so generously give their precious time and life on this earth away from their families to protect our freedom in this country. I personally want to thank all the veterans who are in the armed services serving this country currently and those who have served in the past and in the future. I appreciate your bravery and love for this country! May God Richly Bless You for Your Selfless Sacrifice...Thank You! 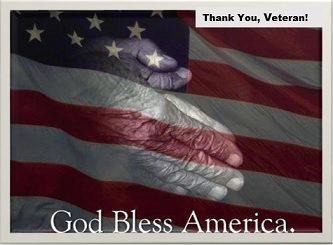 Front of Card - Beautiful image (pictured above) with the words "Thank You Veteran!" and "God Bless America." Inside of Card - "Dear Veteran, I salute your courage, your honor, and most of all, your sacrifice. Please accept this special “Thank You” from [Church Name] who truly appreciates your willingness to serve our country – and what it cost you.Best Regards, [Signature]"
Front of Card - Beautiful image of the American Flag and Eagle with the words "Thank You, Veteran!" and "God Bless America"
Let us never forget all they have done and are going to do so that we can have our freedom here in the United States and abroad! Return to Veterans Day Ideas from Printable Thank You Cards for Veterans.